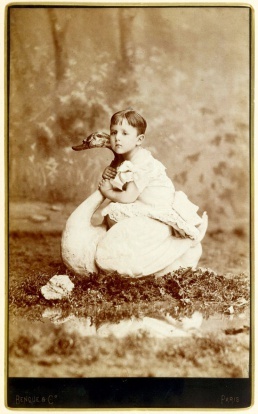 Raymond Roussel, age three, on a swan. 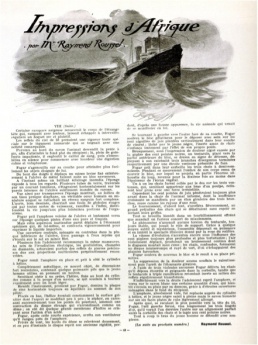 A page from a serialized publication of the novel Impressions d’Afrique in Le Gaulois du Dimanche, 1909. 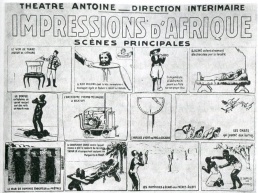 Poster for the theatrical version of Impressions d'Afrique, Paris, 1912. 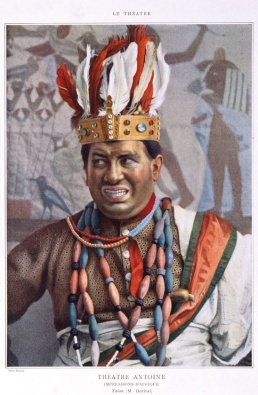 Theatre Antoine, a scene from Impressions d'Afrique, Dorival in the role of King Talu VII, 1912. Theatre Antoine, a scene from Impressions d'Afrique, the execution of Djizme, 1912. Raymond Roussel (1877-1933) was a French poet, novelist, playwright, musician, and chess enthusiast. Through his works he exerted a profound influence on certain groups within 20th century French literature, including the Surrealists, Oulipo, and the authors of the nouveau roman. This section is sourced from Museo Reina Sofia exhibition dossier. 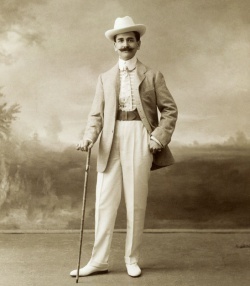 Raymond Roussel, the author of The View (1904) and Locus Solus (1913) occupies a unique place in literature, to which he dedicated his entire life and consecrated a large part of his fortune. In the ten works he brought out during his lifetime - poems or verse novels, tales or plays - he aimed at creating a world from scratch in which “imagination is everything”, and in which nothing real should impinge on the writing. Absorbed in this enterprise and convinced of his genius, he lived through the first third of the 20th century without paying any attention to its political upheavals or their aesthetic consequences among the various avant-garde movements, while failing to understand why the more conventional audience he thought he was addressing remained indifferent to his work, and found its stage adaptations scandalous. Often described by his contemporaries as a haughty dandy, he did indeed spend most of his life retired from society, and though his “life was constructed like his books”, in the words of the psychiatrist Pierre Janet, he was in reality an enthusiastic character, whose worship of genius came firstly from his loyal attachment to his childhood memories and reading, and subsequently from his devotion to those whom he considered to be great minds: Jules Verne and Pierre Loti with their real or imaginary travels, the astronomer Camille Flammarion or the poet Victor Hugo. However, he remained distinct from the last two on this list because of his refusal of anything supernatural, which he replaced by the absolute value of invention, set in a theatrical universe constructed by a chain of enigmas, the solutions of which were always impeccably logical. 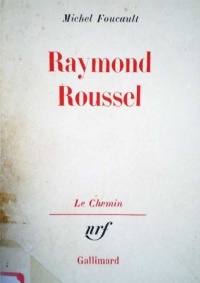 It was above to channel his overpowering imagination that Roussel conceived some of his works using a “highly special procedure”, which he was to reveal only in his literary testament published after his death: How I Wrote Certain of My Books. This procedure, “related to rhyme”, is based on combinations of homophones and the association of words with double meanings. 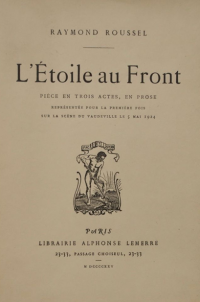 It is the distance between these terms, placed invariably at the beginning and end of each story, that would later provide Roussel with a framework for his writing as well as an inexhaustible store of unexpected images and stories, such as the “statue of whalebones” or the “worm playing a cithara”, in his Impressions of Africa. The posthumous revelation of Roussel’s writing procedure has lastingly influenced his reception, and as a result many critics have often considered him, wrongly, to be a mere manipulator of words, thus confirming the thesis that his was a modern form of writing, based only on self-referentiality and arbitrary constraint. Even if he was only to become aware of the fact late in his life, during his lifetime Roussel attracted a great deal of enthusiasm among a generation of artists and poets. It was one of the performances of Impressions of Africa in 1912 that Marcel Duchamp, who was there with Guillaume Apollinaire and Francis Picabia, was to recall and mention as a primary influence on his Large Glass. The photographic precision and laconicism of Roussel’s writing, his taste for technical and scientific innovations, as well as the absence of any psychological depth in his characters, who come over as simple puppets lacking in depth, come together to make Roussel one of the sources of the “bachelor machines”, as the writer Michel Carrouges pointed out in 1954. Marcel Duchamp seems to have made Roussel’s name known to the Parisian Dadaists, who were to discover him during performances of Locus Solus in 1922. Philippe Soupault, Paul Eluard and Roger Vitrac then took up his defence in Dada and then Surrealist reviews, seeing him as an equivalent of Douanier Rousseau, or comparing the park in Locus Solus to the deserted esplanades of Giorgio de Chirico. A “Rousselian” cult then progressively took form: ‘the President of the Republic of Dreams” (Louis Aragon), “the greatest mesmerist of modern times” (André Breton), “his eye glued to his microscope” (Robert Desnos), Roussel was, for the Surrealists, the person who engineered “the escape from the world of reality into that of conception” (Michel Leiris). Leiris was linked to Roussel though his father, who was the Roussel family’s business manager, and he closely associated his passion for the author with his own work as an ethnologist, placing under the auspices of Impressions of Africa his first ethnographical expedition to Dakar-Djibouti in 1931-1932, which was partly financed by Roussel, and which was directed by Marcel Griaule. In the pages of Georges Bataille’s review, Documents, Leiris hailed the depiction in Impressions of an Africa that was so marvellous that its exoticism owed nothing to the colonial stereotypes of the time. Reading Roussel was also fundamental to the creation of Salvador Dali’s paranoiac-critical theory during the 1930s. To Roussel’s doubling of words, Dali answered with a doubling of images; and it was the crystal transparency of Roussel’s texts, in particular his poem "The View", that provided Dali with a model for his “rigurosa lógica de la Fantasía”, confirming the necessary exactitude of the imagination, thus giving rise to visions that materialise subconscious desires as closely as possible. In an article published in the review Le Surréalisme au service de la Révolution, in 1933, a few months before Roussel’s death, Dali paid homage to the “ungraspable” character of New Impressions of Africa, his last published poem, which he had worked on for ten years. In this text, Roussel sacrificed the transparency of his writing for a principle of permanent digression. Practically every word of the poem is a pretext for an analogy or comparison, while opening a breach in the text from which then surges a series of commentaries, judged to be “impenetrable” by Dali. Roussel’s insistence on concision forced him to increase the number of ellipses as his text swelled with digressions. Probably with a view to finding a system that would simplify reading it, and point to an order in the intertwining of narrative threads, Roussel opted for a typographical device, cutting up his text with brackets nestled in layers. Along with the mysterious illustrations, which Roussel ordered from the conventional painter Henri Zo, New Impressions stands as a complex book-object which was to inspire several “reading machines”. 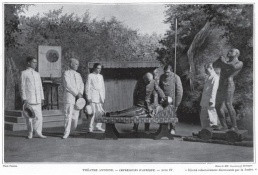 The reception of Roussel after the Second World War was essentially the work of the Collège de ‘Pataphysique, founded in Paris in 1948 to celebrate the fiftieth anniversary of the publication of Alfred Jarry’s Docteur Faustroll. Thanks to the publications of the Transcendant satrape Jean Ferry, who set about an erudite, literal deciphering of Roussel, without attempting to interpret him, and the “Machine for reading Roussel” (1954) by the Argentinian artist Juan Esteban Fassio, the trend was now to adhere literally to Roussel’s texts and provide them with illustrations. It was for the Collège that Jacques Carelman produced, on the invitation of Harald Szeemann, two sculptures based on descriptions in Locus Solus for the Bachelor Machines exhibition (1976), while Jean-Christophe Averty was to conceive a televised version of Impressions of Africa (1977). Since the 1960s, Roussel’s oeuvre has been widely translated, especially in the United States thanks to the poet John Ashbery who, after carrying research in Paris during the 1950s into the author of Locus Solus, founded a review of the same name with, among others, Harry Mathews, who wrote a brilliant Rousselian pastiche with Georges Perec in 1977. The influence of the review Locus Solus, which was little noticed at the time, nevertheless brought Raymond Roussel’s name to the poets of the New York School. Meanwhile, the writings of Michel Foucault, Michel Butor and Alain Robbe-Grillet were the source of interest in Roussel among numerous artists, including Vito Acconci, and in the 1980s in Los Angeles, Allen Ruppersberg, Morgan Fischer and Mike Kelley, centred around the recently rediscovered work of the French artist Guy de Cointet. Readings and interpretations of Roussel have changed enormously over the past century, and the figure of this writer, who throughout his life guarded against revealing the slightest information about himself and kept an air of mystery around the genesis of his works, has become an essential model of the artist, standing as the Minotaur at the centre of the labyrinth of his work. 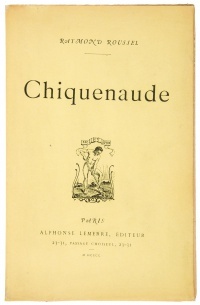 At the end of the 1980s, the discovery of a considerable stock of archives and manuscripts, many of them unpublished, now conserved at the Bibliothèque Nationale de France, has shed new light on his oeuvre, confirming Michel Leiris’s view that “no one has ever touched so closely the mysterious influences that govern the lives of men. 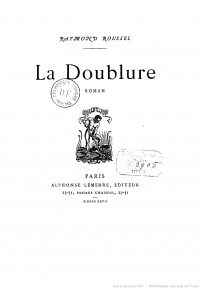 La Doublure, 1897, BnF, WS, PDF. 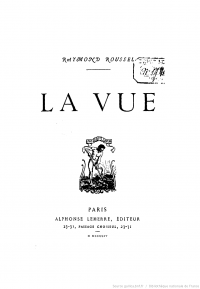 La Vue, 1904, BnF, WS. 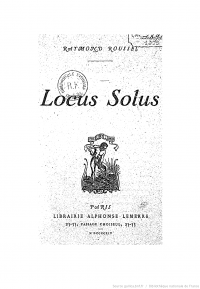 Locus Solus, 1914, BnF, WS, PDF. 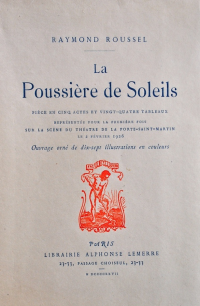 La Poussière de soleil, 1927. 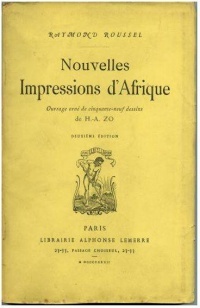 Nouvelles impressions d'Afrique, 1932, BnF. 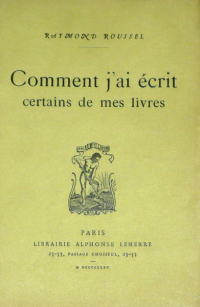 Comment j'ai écrit certains de mes livres, 1935. Locus Solus, trans. Rupert Copeland Cuningham, London: Calder & Boyars, 1970; repr., Richmond: Oneworld Classics, 2008. (English) Review: Dan Visel. New Impressions of Africa, trans. & intro. Ian Monk, London: Atlas Press, 2004, 256 pp. (French)/(English) Review: James Elkins. How I Wrote Certain of my Books, trans. Trevor Winkfield, Exact Change, 1995, 288 pp. 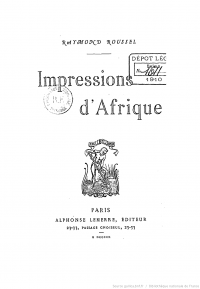 (English) Contains a cross-section of his major writings, including Roussel's essay on how he composed his books, the first chapter of each of Impressions d'Afrique and Locus Solus, the fifth act of a play, the third canto of New Impressions of Africa and all 59 of its drawings, and the outline for a novel Roussel apparently never wrote. 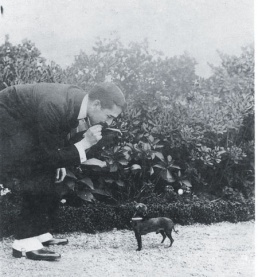 Death and the Labyrinth: the World of Raymond Roussel, trans. Charles Ruas, Athlone, 1987, 186 pp; Continuum, 2007, 227 pp, ARG. (English) Review: John Sturrock. Alastair Brotchie, Andrew Thompson (eds. ), Raymond Roussel: Life, Death and Works, London: Atlas Press, 1987, 157 pp. (English) Review: John Sturrock. Locus Solus: Impressions of Raymond Roussel, an exhibition at Reina Sofia, Madrid, 2011-12. Nouvelles impressions de Raymond Roussel, an exhibition at Palais de Tokyo, Paris, 2013. Review: Joseph Nechvatal. This page was last modified on 14 April 2017, at 13:12. This page has been accessed 17,642 times.